Pino Scotto - "Eye For An Eye"
Pino Scotto, charismatic icon, rock soul for excellence of the Italian scene, returns after "Live For A Dream" of 2016, with the new album "Eye For An Eye" for Nadir Music, both in the classic physical and digital format, containing eleven songs based on the heavy rock musicality of the seventies and eighties. 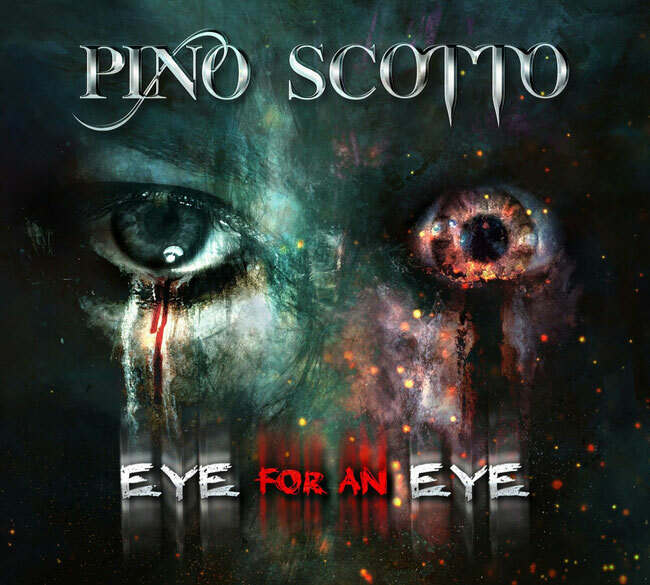 Pino Scotto in "Eye For An Eye", unleashes, as always, his grit and his anger with what is his marked scratchy voice that has always been his peculiarity since the beginning of his career. The album opens with the explosive title track "Eye For An Eye", a song in which the voice is the absolute protagonist, accompanied by a guitar so powerful, to cope with the vocalization. This song is a real whipping that engages in listening, a song that would continue to listen, so much is the charge that manages to emanate. A blast of blues in the second is the second track in full heavy rock style "The One", whose contagious refrain remains well impressed that manages to involve in the entirety of the whole song, and a beautiful solo guitar, they succeed in creating this piece, to make a great shot scored by our local rocker. The following track "One Against The Other", is a vortex that draws in its own spiral, an incessant song, maintaining a sustained, uninterrupted and dynamic rhythm. We move on to "Two Guns", another heavy song, with stoner veils, which unfolds in a harsh and harsh atmosphere, an excellent piece in which Pino Scotto reconfirms the figure acquired by right, of true rocker, without frills and without having to prove to be the excellent performer of their pieces that has always been. We return to rock with "Cage Of Mind", a song with melodic lines that increases the value of this album, increasing the homogeneity of style. With the harmonica intro played by Fabio Treves, it opens beautiful "Crashing Tonight", a classic rock song, a bit in Led Zeppelin style. The following "Angel of Mercy", a delicate and touching piece, which shows the kind spirit of Pino Scotto, a part of his personal, a piece dedicated to a missing person, is exciting and exciting. Not a ballad but still one of the songs that is detached from the roughness of the whole album. Another very interesting song is "Looking For A Way", a great vocal rehearsal that shows a little of the Vanadium metal glories, and here, the umpteenth demonstration of how much time has not scratched Pino's spirit. Another really exciting song is "Wise Man Tale", with which we go back in time, eight years to be precise, song taken from the album "Third Moon" of the Fire Trails, of which Pino Scotto and Steve Angarthal have been part . It continues with two tributes, the first to Sammy Hagar with a lively and exuberant cover, of "'There's Only One Way To Rock'", song of 1981, and the second to Allman Brothers with "One Way Out", originally written from Sonny Boy Williamson II and Elmore James in 1971. A track in which Pino's love for blues and rock stands out, with the most excellent Treves harmonica. And it is with this song that ends "Eye For An Eye", an album exactly as expected, alive, sanguine and sincere, exactly like Pino Scotto. Our rocker is back and is always in a dazzling form, fierce to defend rock music and those who play it with great passion. The same passion that brought Pino to here, with this new chapter of his long artistic career. There are few artists who remain faithful to their artistic choices and consistent in their choices, Pino is exactly one of these musicians, always faithful to his line of thought that has made his life revolve around the fantastic world of rock. Chapeau Mr.Scotto!